Transport Stream file is shorted for TS. Using this converter, you can convert many video or audio files to enjoy the life.You can use TS Converter for Mac to trim,crop,modify effect and watermark.This guide will show you how to use TS Video Converter specifically on Mac. Download TS Converter and install it on your Mac. Step One: Import files you want to convert. There are three ways to load your files on it. 1. You can import video and audio files by clicking button. 2. You can also click File on the top menu. Then select "Add Video" from the drop-down menu to add your video or audio source file. 3. Drag the video and audio files into the file list area of main interface directly. This TS Converter for Mac places the profile in order, and sorts it by General video, General audio, HD videos. After you select the profile, continue to select the format on the right drop menu. Video Settings: Set video encoding settings by selecting encoder, resolution, frame rate, video bitrate and aspect ratio. Audio Settings: Set audio encoding settings by selecting a encoder, a sample rate, channels and audio bitrate. For Resolution setting, you can choose the pre-set Resolution from the right drop-down list. You can also customize the video and audio encoding settings and save them as your own profile. After you have chosen the encoding options, just click the Save as... button and name your profile, and then the profile will be saved in the User Defined list. You can use the customized profile next time by selecting it from the list. Click "Browse" button to select storage path of converted files. After all the steps above are done, click to convert files. Free download this versatile TS Converter for Mac and have a different digital life. Click effect button to open the edit window to adjust the video effects. Deinterlacing: when you convert the interlaced video formats such as 720i, 1080i to obtain better output videos, you can set the Deinterlacing function to avoid the mosaic. Click trim button to open the edit window to trim any video clips. 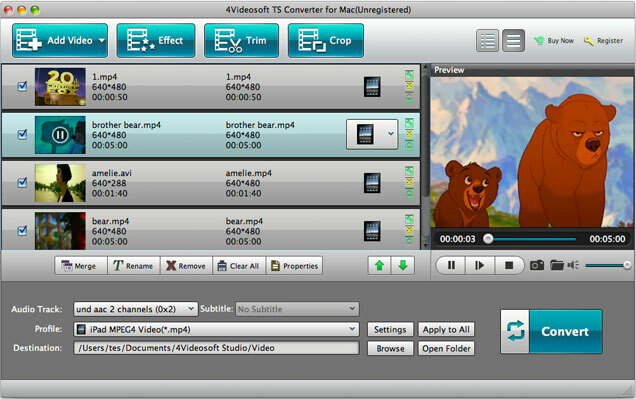 TS Converter provides you three methods available to trim your video length. Method 1: Enter the start time in the Start Time box and click OK, then enter the end time in the End Time box and click OK. Method 2: Drag the slider bar to preview the video what you want to cut. Method 3: While playing video, click left-branch button near the stop button to mark the beginning of your clip and the other one to mark the end of your clip during the preview. Click crop button to open the edit window to customize the video play region. Method 1: Crop by adjusting the crop frame The crop frame is the yellow line around the movie video. There are eight small adjustment boxes on the crop frame. Each adjustment box allows you to crop the movie video from a different position. To crop your movie video, you can just move your mouse cursor to an adjustment box and drag the crop frame. Method 2: Crop by setting the crop values There are four crop values at the bottom of the window: Left, Top, Right and Bottom. You can set each value to crop your movie video, and the crop frame will move accordingly. Keep Original, Full Screen, 16:9 and 4:3. 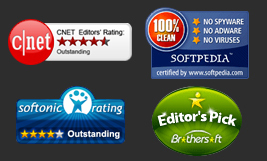 Note: The cropped effect can be viewed in the right preview window simultaneously while you operating. Click the current picture in the preview window will be captured and saved in the specified folder in the image type as you have set. Click to open the snapshot folder to view the captured pictures. Click "Preference" menu to adjust the settings related to conversion. General: Set the output folder, snapshot folder, image types, converting done action and CPU usage. Options: You can choose language and skin.